Don’t we all simply hate that moment when you realize that the beautiful pendant necklace you bought last week doesn’t go with the outfit you planned for it or how so many other pieces are just lying in your closet waiting to be worn out in the world but you just can’t figure how to style them the correct way? Here’s how to end all those troubles. Read along and help yourself out! 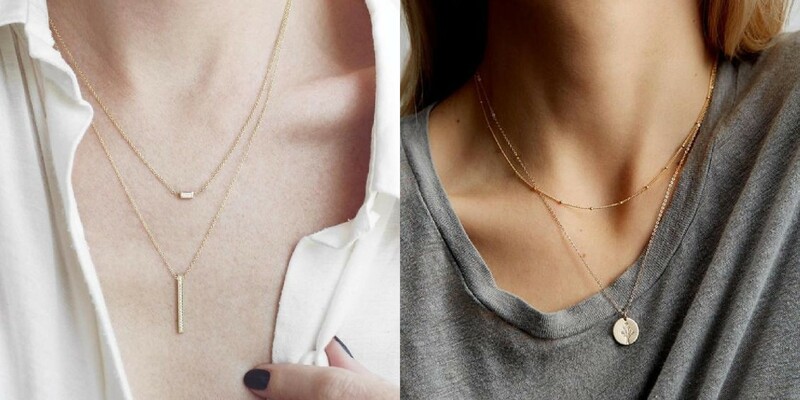 When it comes to pendant necklaces, length means a lot. It’s basically the length of the pendant which decides what kind of outfit to go with. Small pendants are easy to style and can be worn with shirts or simple round neck t-shirts, whereas the longer ones require some special efforts. Long pendant necklaces usually go well with flowing long tops or loose fit dresses which give them more room to stand out. Make sure you go with solid colors or fine prints and avoid large prints as they camouflage the jewelry with their design. V-necks are back in trend and your favorite pendants can be another reason to embrace the style once more. V-necks give plenty of room for your neck and chest to flaunt and what’s better than a shining little piece of jewelry to add more charm? Opt for some multi-layered chains with v-necks as they compliment their natural descending shape. Make sure the necklace length is neither too short nor too long but just the right length. When dealing with pendant necklaces, no matter what, going with traditional outfits might just be the best option. These necklaces look really nice with classic Indian wear. 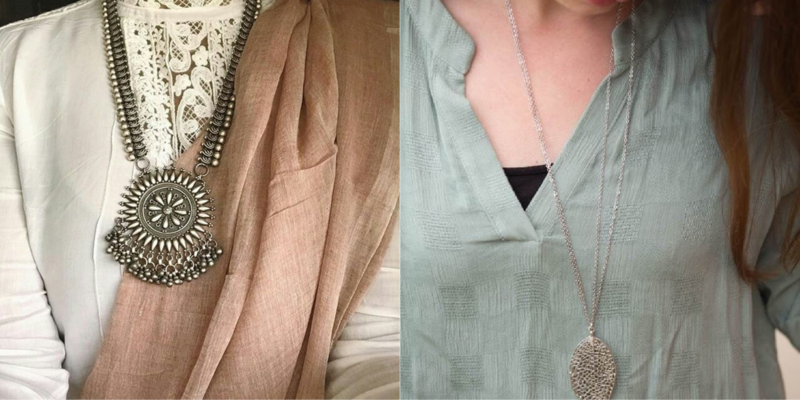 Go for a plain cotton saree or a kurta and pair it up with a big silver pendant necklace. We think this patterned dramatic single locket would look superb with any desi wear! 4. Say yes to Off-shoulders and Sweethearts! Off-shoulders are love! And so are sweetheart necklines, and what if they both go very well with your very favorite neck pieces? You read it right. 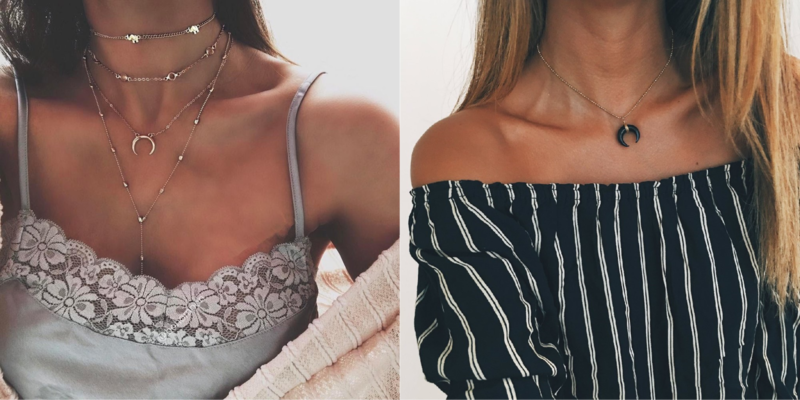 Small pendant necklaces look real good on off shoulders and sweethearts as there is enough open space for them to be seen and to emphasize your collar bones. So, get some funky blouses and pair them up with your pendants and see how well they go together. Play with styles and create something new, something of your own to look your very best in everything you wear. And guess what? We have some awesome pendant necklaces just for you. Click here and find some awesome pieces to add to your collection right now! This entry was posted in Create the Look and tagged Jewelry, Pendants, silver jewelry.